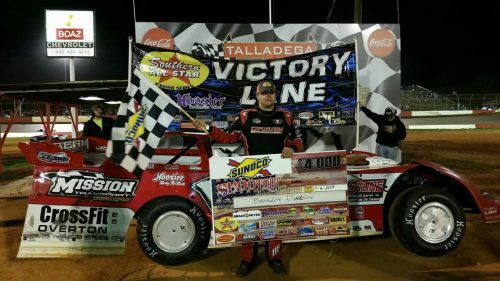 EASTABOGA, AL-Brandon Overton of Appling, GA., scored his second career Southern All Star win Saturday night at Talladega Short Track at the annual NASCAR Weekend event, paying $4,000 to win. Overton passed race leader Dale McDowell on lap 28, then slid up the track coming off turn two giving McDowell another shot at the top spot but McDowell could not hang on as they entered turn three when Cory Hedgecock of Loudon, TN., slipped his nose in and tried to take over the top spot but could not and Overton then checked out on the field till a late race caution bunched the cars back up behind Overton, but he prevailed and got the win his first at TST. 1994 Southern All Star Champion Dale McDowell came home in the second spot, third went to a Talladega Short Track veteran Dallas Cooper of Talladega, AL., who worked his way to a third place finish from his 7th starting spot, fourth place was Hedgecock and fifth place went to Todd Morrow who worked his way through the field from his 11th starting spot. Brandon Kinzer finished 6th, Douglas Stewart finished 7th from his 16th starting spot, Eric Hickerson finished 8th from his 18th starting spot, Austin Horton came home 9th and Brad Skinner 10th from his 22nd starting spot. RACE TIDBITS: Points leader Bo Shirley fell out early and finished 16th, but still maintains a 4 points leader of Austin Horton heading into this week’s race at Thunderhill Raceway in Lawrenceburg, TN. Shirley was strong at this race in 2016 set fast time and led a majority of the laps his way to the win till transmission problems ended his night with a few laps remaining. T J Reaid of Acworth, GA., had early race contact with Overton then with Terry Smith ending both drivers night. 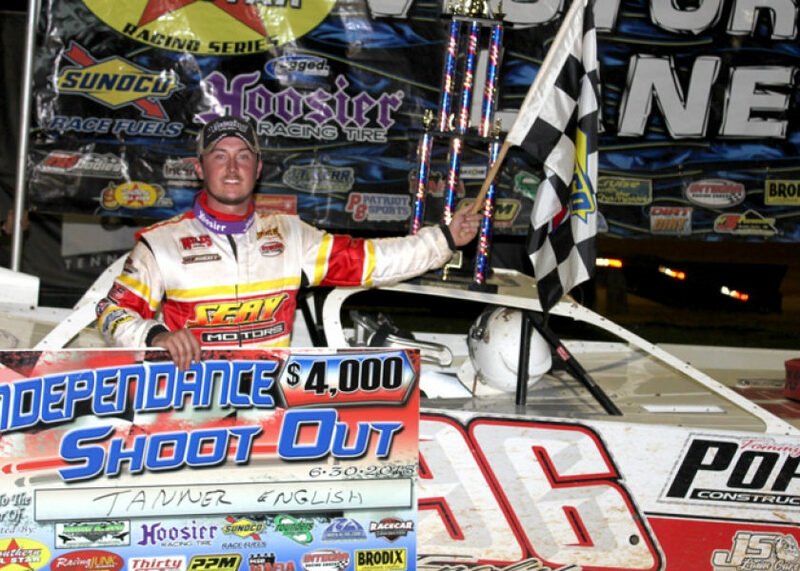 2016 Cruise with the Champion.Dirtondirt.com Rookie of the Year Brad Skinner was back in action after wracking a car at Smoky Mt earlier in year and had and impressive run from his 22nd spot to finish 10th. 2015 Southern All Star rookie of the year Dillon Tidmore made his first appearance oaf the season. Four time Southern All Star Champion Riley Hickman also made his first appearance with the series in 2017. 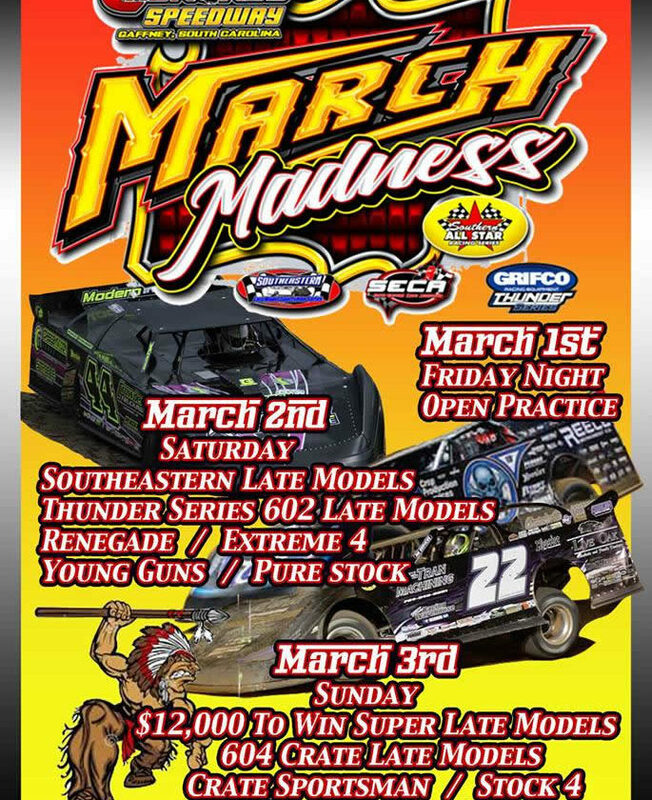 The next Southern All Stars event will be on Saturday night May 13th at the Thunderhill Raceway in Lawrenceburg, TN., a 40 lap $4,000 to win event.